For many emerging U.S.-based biopharma companies, taking their first product to Europe is a daunting prospect. Running the gauntlet with European regulators and payers can be challenging for an inexperienced company, and operational requirements of a dual launch in two different regions, within a compressed timeline, can be significant and distracting. Biopharma executives agree that for the right drug, a “go it alone” strategy can create more value than out-licensing would. Beyond the impact of the therapy itself, several other factors determine the overall outcome when launching in Europe: over-investing in talent, empowering the European team, planning and preparing early, sequencing the country launches and balancing regional vs local European resourcing. The launch of a first product marks a major turning point for biopharma companies. As companies transition out of R&D mode and into a revenue-driven stage, operating expenses are scaled up but need to be carefully managed with an eye to midterm profitability. 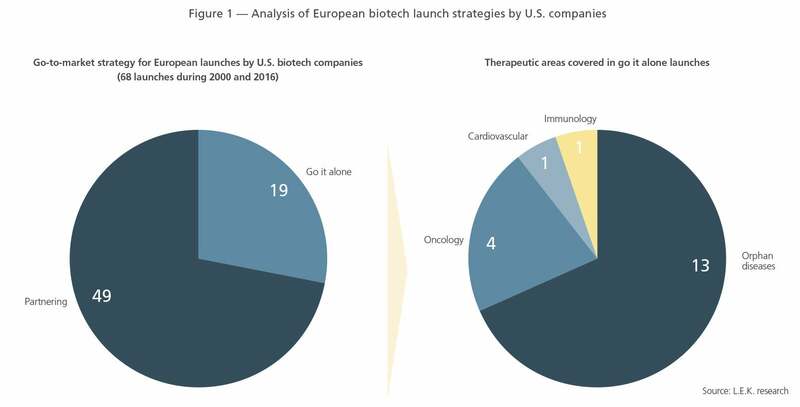 In this context, most U.S.- based biopharma companies tend to focus on their U.S. launch while considering whether to “go it alone” or out-license in Europe. For many emerging U.S.-based biopharma companies, taking their first drug to Europe is a daunting prospect. First, the European pharma environment is complex, and a “one size fits all” strategy will not address the regulatory and reimbursement hurdles presented by each European market. Running the gauntlet with European regulators and payers can be challenging for an inexperienced company. Second, the operational requirements of a dual launch in two different regions, within a compressed timeline, can be significant and distracting. As a result, out-licensing has often seemed the easier option for many organizations — but it risks leaving significant value on the table. Why do biotech companies make the decision to build an operational capability in Europe around a first product launch? Are certain drugs better suited to a European launch than others? What are the key success factors for establishing a European presence and launching therapies in-house in Europe? Finally, what are the implications for biotech executives considering a first product launch in Europe? Of 68 companies that launched their first product in the U.S. between 2000 and 2016, the majority (49 companies) partnered on the European rights to their first product with an established regional or global player to access the European markets. The remaining 19 companies participated fully or partially in the launch of their first product in Europe by building operations and developing a team to support commercialization. Thirteen of these 19 European biotech drugs were focused on orphan diseases, four on oncology, one on cardiovascular diseases and one on immunology (see Figure 1). All these companies built their European commercial infrastructure from the ground up, with the exception of two companies that leveraged either an acquisition or a commercial partner to jump-start their European team and infrastructure. As our panel of experts revealed, the key reason for retaining the European rights of their first product was economic value. A good example was a U.S. rare disease company. When faced with the decision of whether to out-license in Europe or launch internally, the initial plan was to seek a partner. However, after conducting a thorough analysis of going it alone versus partnering, the company realized that the benefits of going it alone outweighed the risks. This was similarly a factor for a U.S. oncology company when it decided to build a presence in Europe for its hematology-oncology franchise. According to our executive interviews, if the commercial investment required is in the 10%-15% range of peak revenues, it is more attractive to go it alone in Europe than giving margins of 30%-40% to local or regional promoters and distributors. Another reason for retaining European rights is the importance of control over the messaging, pricing, commercialization and branding of a first product. By owning and controlling the full commercialization of a first product, a biotech company positions itself to integrate a global brand plan, harmonize global market access and address the potential reference pricing issues from Europe in other regions of the world. Launching in Europe also helps build international capabilities and a global infrastructure that the company can leverage for a broader portfolio in the future. Lastly, some U.S. biotech companies did not have a choice — they had to establish capabilities in Europe because of the sequencing of their first product launches across the two regions. InterMune is a good example of a company that faced a European launch decision after its first drug, Esbriet, was delayed by the FDA. In that case, the opportunity to own and control the launch in Europe may have held appeal, as it allowed InterMune to transform the company into a commercial organization, generate revenues in Europe to fund U.S. operations, and build market knowledge and relationships with key opinion leaders that the company could leverage to prepare the U.S. launch. Going it alone has a number of benefits, but it might not be right for every drug. Emerging U.S. biopharma companies without a footprint in Europe need to think carefully about whether an in-house launch makes economic sense. Pharma executives point out two triggers for taking the risk of commercializing alone in Europe: a differentiated value proposition that addresses clear unmet needs and provides potential for premium pricing, and focused call points. A differentiated value proposition is crucial in Europe’s demanding payer environment, where cost-effectiveness or clear superiority to the standard of care on efficacy are prerequisites for market access and premium pricing. As one industry expert pointed out: “You have to keep in mind the budgetary constraints in Europe. There is essentially one payer — the taxman. So to ensure pricing power, you need a strong value proposition addressing a real clinical need.” Payer concerns around overall budget impact therefore make low-volume orphan drugs particularly viable candidates for European launches. While not viewed as a prerequisite, prospects of expanding the first product life cycle into additional indications can also justify an in-house launch. This was the case when Intercept built its European commercial infrastructure for Ocaliva, a drug to treat primary biliary cholangitis (PBC). The company made its first launch in an orphan indication, PBC, but also had a second indication in the pipeline: non-alcoholic steatohepatitis, which is much more prevalent and targets more call points. The prospect of a second (larger) launch coming may justify the investment in building out infrastructure in Europe. Once these initial hires have joined the company, they can drive additional talent acquisition and build a fully integrated team. It is crucial to promote a culture that ensures staff retention. As one industry expert pointed out, “Getting married is easy; staying married is another thing.” So how do you keep the talent? Good career prospects, a company culture that rewards creativity, and a strong mission and sense of purpose are key factors. Talented people want to move up the career ladder. They also want to feel empowered and be able to build on their creativity. Freedom to maneuver in Europe should extend beyond hiring. The executives we spoke to stressed the importance of giving the European team the autonomy to make key decisions for their markets — within the confines of the overall launch strategy. Finding the right balance between centralized decision-making from a U.S. headquarters and regional autonomy is therefore an imperative for building a winning European organization. And there is a clear hierarchy in the hiring process: Start with the region head, then prioritize the regulatory, market access and medical affairs leads. As some experts mentioned, “You build out your medical liaison team early — that is key. Do that 12-18 months before the product launch. It is important to build KOL [key opinion leader] relationships early on.” In a second wave, build commercial teams at a country level, with a strong country manager as the first hire. A staggered hiring process helps maintain focus and flexibility and avoids overspending on upfront costs, thus de-risking the launch. Differences in market access among European countries call for a sequenced launch. While there is no set launch sequence, all the executives we spoke to agreed that the countries that provide early access and reimbursement should be tackled first. In many cases, Germany is the first E.U. launch, as reimbursement is automatic for European Medicines Agency-approved drugs, and manufacturers are granted a year of free pricing while P&R negotiations are ongoing. Launches in Austria, Switzerland and the Nordic region frequently coincide with the launch in Germany due to relatively higher pricing levels compared with other regions, e.g., Southern Europe. For certain indications, early access programs can facilitate launches in France, Sweden and Italy shortly after approval. The U.K. and Spain often follow in a later wave, as reimbursement is dependent on the outcome of cost-effectiveness assessments (U.K.) and lengthy negotiations with national and regional decision-makers (Spain). The task of commercializing a first drug in Europe alone is a challenging one. Licensing out the European rights to an established commercial partner avoids many of the operational, regulatory and commercial pitfalls of going it alone. However, for the right product, Europe is an attractive market with clear value, despite its complexity and budgetary constraints. Building a commercial team and a “bricks and mortar” operation across multiple countries requires significant capital. Understand the financial impact of going it alone in Europe and the potential shareholder dilution. First product launches in Europe often unnecessarily take place with a timing close to U.S. market entry. Do not underestimate the operational distraction of a dual launch into two regions. The pool of resources and talent is dispersed in Europe, and there are few biopharma clusters. Select the location of your European headquarters early, and over-invest in a high-quality team with commercial experience and an entrepreneurial, “startup” mindset. Commercialization and market access in Europe are fragmented and complex. Initiate launch planning at least two years prior to approval. Many functional activities necessary to ensure a successful launch in Europe need to take place at a local level. Give the European team flexibility and the right level of autonomy to operate in its targeted geographies. If all the above criteria are satisfactorily addressed, building a European presence and launching directly can provide a solid platform for international growth and expansion, creating meaningful shareholder value while also making a difference to patients. 1 Views in this article reflect the combined experience of L.E.K. Consulting and Korn Ferry, as well as guidance from interviews conducted with seven commercial leaders from biotech companies that have built commercial operations in Europe to support their first product launch.